I am no chocolatier, pâtissièr or even chef. But I do love to experiment. And I like a bit of a challenge too. 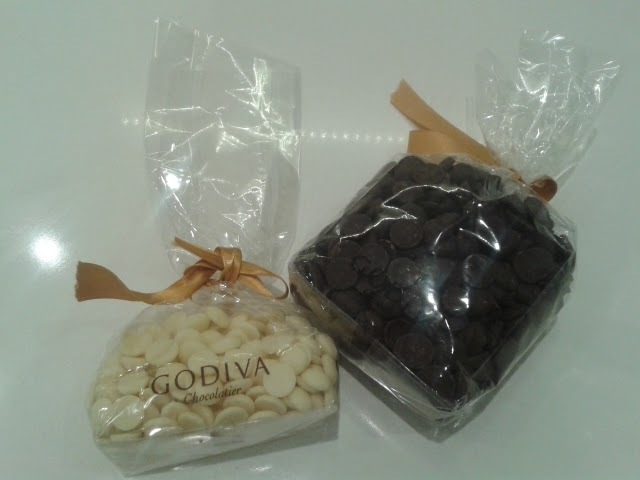 So when I saw the Godiva Chocolate Challenge (#GodivaChallenge), I was rather a little excited! The brief is to create 'a chocolate dessert whose presentation, creativity and texture reflects the craftsmanship and excellence of Godiva'. The judges are restaurateur Mark Hix, food critic William Sitwell, chef Juliette Nothomb and Godiva's head chocolatier Thierry Muret. The prize is a trip to Brussels to visit Godiva's Atelier of Chocolate Innovation and the honour of having the winning dessert on the menu at Hix for a week! All for making a delicious chocolate dessert! However after checking out a few of the other entries, I accepted the reality that for me at least, it was just going to be a bit of delicious fun, as I will get to watch other renowned and talented Foodies show us their stuff. 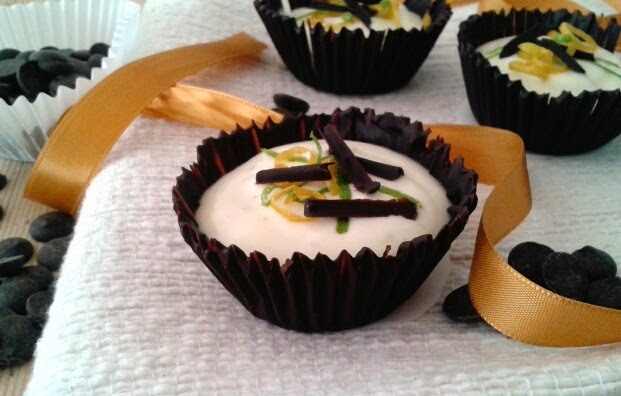 I chose my favourite non-chocolate dessert - lemon and lime tart - and decided to put it in a chocolate cup. This led, as you may expect, chocolate fans, to my first attempt at tempering. I've heard it talked about in cookbooks and on TV food shows, but never imagined I'd ever get round to doing it myself. However, it's an essential technique for achieving beautiful shiny evenly textured chocolate that is the signature of professional confectionery. That crisp snap when the chocolate is broken is a sign it is tempered correctly. Of course if this snap happens when you are removing the cups from the mould, it's not so good. But out of 15, hopefully you'll get a few pretty ones! There are acres of pages describing how to temper chocolate and hundreds of websites demonstrating it, so I have found the easiest, quickest, most amateur way of presenting these chocolate cups I could, and it is surprisingly simple. Don't be fooled into thinking this makes me a chocolatier extraordinaire, it doesn't, at all, but it's impressive for a first attempt, no? It tastes delicious, if I say so myself, zingy and smooth, and I'll be practicing this again and again to improve my tempering! Temper the chocolate by melting for one minute at half power in the microwave. Give it a stir, then another 30 seconds. It should have mostly melted, but not completely. Remove from the microwave and stir the remaining un-melted pieces until all are fully dissolved. Allow to cool slightly before using. Ideally you would use a sugar thermometer to ensure it is at about 32 deg C to use. And that's it! Tempered! Dip in a flat paintbrush, tap off any excess and paint the inside of the mould or cupcake case, starting at the bottom and up the side. Make sure there are no gaps, but don't worry if it's a bit messy inside, it will be covered later. Paint it on quite thickly, to make it easier later, when you have to remove it from the mould. A thin layer of course looks fantastic and very professional, but remember who we are... Make about 15 then you can be sure you will have enough in case of breakages. Allow to set in the fridge for at least an hour, overnight if you have time. Grate the lemon and lime zest and squeeze and strain the juice. Beat the condensed milk and cream in a large bowl using an electric whisk for 3 mins. Reserve 1 tsp of citrus zest for decoration, or make some zest curls. Add the rest of the zest and all juice to the cream mixture and whip for just a few seconds more. The mixture will thicken quickly. Remove the chocolate cups from the fridge. Neaten the top edges by trimming away the tops, with a flat knife edge. Flex back the mould and gently push up the cup from the base. If you are using paper cases, then very gently tear back the paper to free the cup from the case. 3D Space Cookie Cutters - Starfighter!